As the signal and quality levels reported by HDTV tuners are not standardized and thus have no correlation between units, I needed to come up with some other way to determine out how well the HD Pro was performing. I eventually decided on a head-to-head reception competition with my primary HDTV tuner, a standalone Sony DHG-HDD500 DVR. For that I split the cable coming from my antenna two ways, and then fed identical strength signals to both tuners. I would determine the widest contiguous range of reliable reception achievable by each tuner for the same channel, at the same time, measured in degrees using the antenna rotor’s digital display. This would test how well each tuner could cope with the overwhelmingly strong local channels broadcast from 15 miles away, the weak signals from stations up to 100 miles away, and how well each tuner could deal with multipath rejection as the antenna was turned further away from the correct direction. As soon as either tuner hit a position on the rotor that resulted in any sort of picture or audio breakup, that was determined as the maximum rotation in that direction. The antenna system in question is a vertical stack of two extreme fringe UHF yagis, a VHF antenna, a digital rotor and a high quality preamp, all mounted on a 44 foot tower. 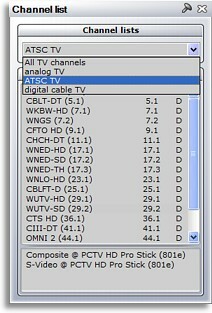 The table below shows the results from all of the channels that I was able to receive. Reception of a few of the furthest and weakest channels can be influenced heavily by weather and atmospheric conditions, which may explain one tuner’s inability to get a lock on this particular night. The number in the left column under each device name is the maximum eastwards rotation of the antenna; smaller is better. The number in the right column is the maximum westwards rotation; larger is better. “Change” reflects improvement of the Pinnacle tuner over the Sony tuner, measured in additional degrees of reliable reception. To say that the HD Pro fared better than the DHG-HDD500 would be an understatement! While not needing to aim the antenna precisely may only seem like a mild convenience, what the chart doesn’t show is how much more reliable reception is with the HD Pro. Random pixellations and audio blips that occurred on the Sony simply weren’t there on the HD Pro – and again, I’m comparing the same signal at the same time. Several small reception holes on the Sony – a few degrees on the rotor where all channels would break up – disappeared using the HD Pro. It was eerie seeing my primary (and very expensive) HDTV tuner offer nothing more than a broken up, unwatchable picture – or even a flat out “No Signal” message – while my laptop with a simple external tuner hummed along smoothly.